Working alongside Fleetcheck we'll provide you with as much or as little management information to run your fleet in the most efficient manner possible. Cars, vans, plant, machinery and HGVs all efficiently catered for. Electronic driver licence checking is seamlessly integrated. Driver management module covers vehicle/equipment assignment, recording of qualifications, training, medical declarations and more. Multiple sources of data are effortlessly combined, for an all-encompassing view of your fleet. Document storage for easy recording and access of important documentation. Market leading telematics solutions to fit your specific tracking and driver management needs. Management of fleet related risks is consciously woven throughout every section of the software. 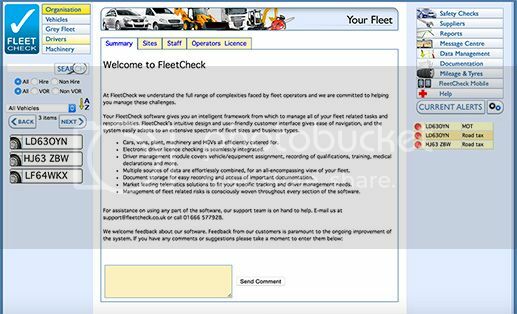 At the heart of FleetCheck's business is a suite of fleet management software solutions. Designed and developed in-house by a highly talented team of IT professionals, our software is the product of several decades of fleet industry experience combined with cutting edge technology and a deep understanding of customer requirements, putting it at the forefront of the fleet software market. FleetCheck customers benefit from a broad range of fleet services in addition to their software including market leading telematics solutions, risk management services, driver training and licence checking, fleet documentation and assistance with fleet policy and strategy implementation. We pride ourselves on providing a complete fleet management consultancy service and can confidently deliver a tailored solution to your business, whatever your fleet size, industry, vehicle portfolio or specific fleet challenges. Contact us now on 01993 894981 or complete an online enquiry and we'll have one of our experienced fleet management consultants contact you.